This is a traffic sign bent by the tsunami. Most of traffic signs on Route 45 in the tsunami-stricken area had been swept away. The sign post on exhibition was recovered in Minamisanriku of Miyagi Prefecture. This is a hazard sign of tsunami installed in a flood-prone area. It was damaged by the tsunami. 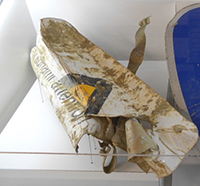 The sign post on exhibition was recovered in Rikuzentakata, Iwate Prefecture. Delineator posts with reflector are installed at both sides of road at certain interval. The delineator on exhibition, which was originally installed along Route 45 in front of the Kesennuma National Highway Maintenance Branch Office, miraculously survived the tsunami, which engulfed the office. The Utatsu Ohashi Bridge on Route 45 (Minamisanriku, Miyagi Prefecture) was engulfed by the tsunami, and its superstructure has been swept away. 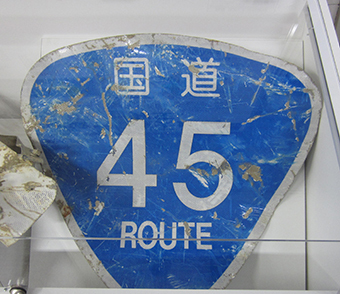 The item on exhibition was the plate of the Utatsu Ohashi Bridge recovered after the tsunami. This is a broken pump of a pumper truck used for drainage of the area flooded by the massive tsunami. The pump was broken, because of such a severe operating condition as debris contamination, 24-hour continuous operation in day and night, etc. This is a CCTV camera installed over the mouth of the Abukumagawa River (Terashima area of Iwanuma). It kept monitoring the tsunami until the CCTV mounted steel tower was collapsed by the tsunami. A water surface cleaning ship moored in the Kitakamigawa River (Ishinomaki, Miyagi Prefecture) was damaged by the tsunami. 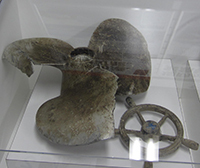 The items on exhibition are a screw and handle of the ship. These are the panels of mileposts bent by the tsunami. A milepost shows distance from a starting point of the road. This is one of the street lights used in the intersections of the road in the night. The post, foundation, and lamp were torn by the tsunami. 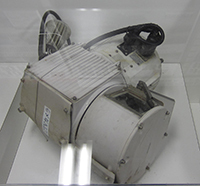 The items on exhibition were recovered in Miyako, Iwate Prefecture. This is a permit of an emergency vehicle used when we scrambled for the affected area immediately after the earthquake. 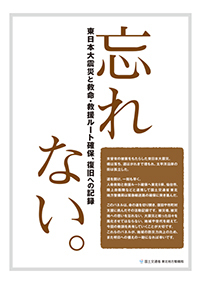 Communication with the municipalities along the Pacific coast of Tohoku was completely disrupted immediately after the earthquake. The first thing the liaisons did when they arrived at the affected area after the road clearance was to deliver satellite phones to the leaders of the municipalities. The item on exhibition was the satellite phone actually delivered to Tanohata of Iwate Prefecture. ・Even if you are out of range of the conventional mobile phone network or there is no relay station, you can call anyone. The shovel on exhibition was one of the 600 shovels delivered to Higashimatsushima (Miyagi Prefecture) by the request of the city. They were used by local residents and volunteers to clear debris in the buildings affetced by the tsunami, restore the roads, or clearn out the ditches. The tsunami that struck Unosumai Elementary School in Kamaishi, Iwate Prefecture reached the third floor of the school building. The “melodica” on exhibition, actually used in a classroom, was given to this exhibition. ※Although Unosumai Elementary School was struck by the tsunami, all the students present safely evacuated immediately after the earthquake and no casualties were reported. The tsunami that struck Unosumai Elementary School in Kamaishi in Iwate Prefecture reached the third floor of the school building. 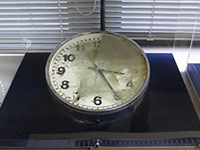 The “clock” on exhibition, actually used in a classroom, was given to this exhibition. This is a road patrol car used for the road maintenance and surveillance of Route 45 by the Kesennuma National Highway Maintenance Branch Office in Miyagi Prefecture. Although the Kesennuma National Highway Maintenance Branch Office was struck by the tsunami, all the staff safely evacuated immediately after the earthquake and no casualties were reported. The exhibition panels show the disaster responses taken by the Tohoku Regional Bureau in the Great East Japan Earthquake. We will never forget anything: the record of the Great East Japan Earthquake, the operations to secure rescue and relief routes, and the restoration works. The Great East Japan Earthquake brought about an unprecedented disaster to the Tohoku region. The bridges were collapsed, the roads were covered with full of debris, and towns along the Pacific coast were isolated. To secure the route for rescue and relief operations, the Tohoku Regional Bureau, a regional unit of the MLIT, scrambled to secure an emergency transport route, in cooperation with six prefectures in Tohoku, the city of Sendai, and the Japan Ground Self-Defense Force. The panel exhibition shows the disaster responses taken by the Bureau staff: how they cleared the debris-covered road and created the Road of Life; how they undertook the restoration works, and supported the affected municipalities. Never forget the days of our struggle against the earthquake. The lessons must be shared beyond the region, and must be passed on beyond the generations. We hope that these panels are helpful to improve the region’s capacity for disaster prevention and preparedness in future. The occurrence of earthquake and approaching tsunami. Support disaster-affected people and area. The earthquake memorial corner has been created in four Michi no Eki (roadside stations). The Tohoku Regional Bureau has created the earthquake memorial corner at Michi no Eki (roadside stations), to make sure that the experiences and lessons leaned from the Great East Japan Earthquake are passed on to the next generation. Panels, monuments, satellite images of the affected areas before and after the earthquake and tsunami, etc. are exhibited in the corners.